When you raise your arms, does it result in an embarrassing moment as your “wings” (loose flesh and fat deposits) drop down and wiggle around for a while? Have you trained yourself not to gesture emphatically- just to avoid this kind of embarrassment? Have you stopped wearing tanks tops, camisoles and even short-sleeved blouses? If so, you may a candidate for brachioplasty, or arm lift. Maybe you’ve tried to solve this mortifying problem – which brings back unpleasant memories of your grandmother on hot summer days — with weight resistance exercises. Has it worked? Probably not. Women tend to ignore their biceps, triceps and other upper arm muscles in their youth. Attempts to reawaken them in midlife rarely succeeds. Fortunately, in the past 20 years plastic surgeons have perfected body contouring procedures. We’ve done this to help people who’ve had gastric bypass surgery, to relieve them of the loose skin left covering their bodies post massive weight loss. We can apply the same techniques to normal people with localized problems. 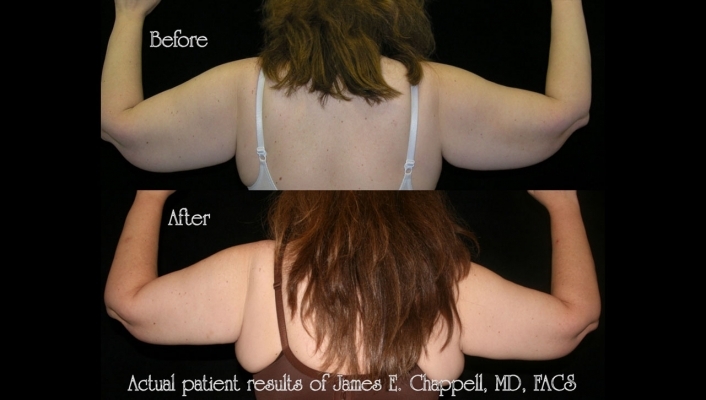 What will be the results of arm lift brachioplasty? The result is beautiful, balanced and proportioned arm contours. You become more confident and comfortable in clothing, especially revealing tops. You’ll see a natural and presentable appearance following the first week that just gets better over the next three to six months. How does Arm Lift Brachioplasty work? Crescent or “smile”-shaped segments of skin and fat underneath the skin are removed from the upper arm, and the remaining skin and tissue are lifted to achieve a tighter and smoother effect. Sometimes liposuction alone is all that is needed to solve the problem (we can determine this at your consultation). In that case, only small inconspicuous incisions are made. Otherwise, the incision may be concealed within the armpit or down the inside of the arm in an inconspicuous location. What’s the Arm Lift Brachioplasty procedure like? A very light general anesthesia is common. Effects last about 2 hours. How long is recovery time for Arm Lift Brachioplasty? Once you wake up you’ll be groggy. Be sure to arrange for someone to drive you home and help you for a day or two. You can go home after several hours. After surgery, you will likely experience some fluid drainage from the incisions. A small drainage tube may be inserted beneath the skin for a couple of days to prevent fluid build-up. To control swelling and to help your skin better fit its new contours, you’ll be fitted with a snug elastic garment to wear over the treated area. You’ll wear this for a few weeks. You can shower on the second day after surgery. There is minimal pain that is mostly gone within a week or two, and is easily controlled by medications. There are stitches that may need to be removed. Expect to be off from work for about seven days. Swelling and bruising are mild to moderate and peak at two to three days, then disappear rapidly over the next three weeks. You can resume many activities within the first week, and most by at least three weeks. Do not expect to look or feel great right after surgery. Even though the newer techniques reduce some post-operative discomforts, you may still experience some pain, burning, swelling, bleeding and temporary numbness. You may still feel stiff and sore for a few days. It is normal to feel a bit anxious or depressed in the days or weeks following surgery. However, this feeling will subside as you begin to look and feel better. We will prescribe antibiotics to prevent infection. You can usually resume vigorous exercise after approximately four to six weeks. Scar care with my special techniques is very important after this surgery. We will show you exactly how to do it. If you are fit when you have this operation, you will recover much more quickly than if you are out of shape. What about Arm Lift Brachioplasty scars? The surgery does produce a permanent scar that varies from barely visible to quite visible. Time will tell how well you scar. After a mastectomy (breast removal) or operations of the axilla lymph nodes. Multiple infections of the sweat glands may contraindicate brachioplasty. If you are considering losing weight, you should wait until after your target weight is met before having this operation. If you have experienced healing problems with any past surgical treatments or if you are prone to keloids (red, angry, raised) scars, your scars could be very visible. If you develop a cold or an infection of any kind, especially a skin infection, your surgery may have to be postponed.